GENEVA, Switzerland -- Twenty years after the fall of the Soviet Union – and despite the hopes raised by the Orange Revolution – Ukraine is still torn between Europe and Russia. 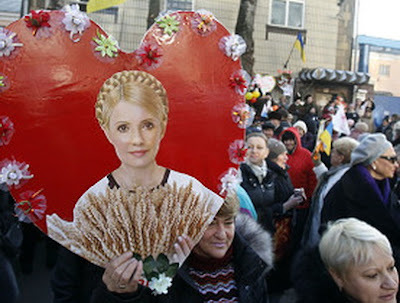 Tymoshenko’s incarceration has provoked diverging opinions from Europe and Russia. Swiss experts say that the country’s search for identity has had an impact on its stability. Unable to realise the hopes raised by the 2004 revolution, Ukraine plunged into a political and economic crisis, exacerbated by the jailing in October 2011 of former Prime Minister Yulia Tymoshenko - a symbol of the opposition – and by the controversial policies of the pro-Russia President Viktor Yanukovych. Considered a geopolitical battlefield between Russia and the West, Ukraine has been trying to straddle the two worlds. “It’s a state torn by civil strife, looking for its own identity,” said Andre Liebich, professor at the Graduate Institute of International and Development Studies in Geneva and expert on ex-communist bloc countries. “On the one hand, there are people who still identify with Russia – the country’s main economic partner – who speak Ukrainian reluctantly and don’t like the moves towards the European Union and especially NATO,” he added. Like many other former Soviet countries – with the exception of Latvia, Estonia and Lithuania which are all members of the EU – Ukraine has not been able to move forward its transition process after the fall of the Soviet Union in 1991. “One of the great problems for former Soviet countries has been pushing through economic reforms while prosperity has been dropping and the social divide growing,” said Jochen Janssen, in charge of Bilateral Economic Relations Europe and Central Asia at the State Secretariat for Economic Affairs (SECO). Ukraine remains a priority country for Swiss cooperation, which contributes more than SFr10 million ($11 million) a year towards stabilising the country. SECO alone has invested SFr142 million in supporting economic and financial sustainability and small and medium-sized businesses. “The lack of diversification and modernisation in the economy, as well as the heavy reliance on energy, makes Ukraine particularly vulnerable to external shocks,” explained Miroslav Veprek, a Ukraine specialist at SECO. The financial crisis of 2008 has brought the country to its knees: more than a quarter of the population live below the poverty line and the hundred wealthiest own assets worth more than 50 per cent of gross domestic product. The drivers of the economy remain heavy industry and agriculture. But excessive bureaucracy and the whiff of corruption complicate foreign direct investments. “Corruption is everywhere and seems impervious to regime change,” said Liebich. Fighting corruption also forms a main part of SECO’s work in Ukraine. “Over the years we have tried to support legal and institutional reform… as well as promote foreign investment and increase the operative efficiency of companies,” said Veprek. Trade relations between Switzerland and Ukraine nevertheless remain modest. In 2009 exports totalled SFr364 million ($384 million), while imports made up SFr61 million ($64 million). SECO says there is far more potential. But Ukraine is the second-largest former Soviet trading partner after Russia - SFr3.18 billion ($3.36 billion) in Swiss exports. Its strategic position means that Kiev plays a fundamental role in the political and economic stability of Europe. It is a member of the Commonwealth of Independent States and has been part of the World Trade Organization since 2008. “Ukraine is due to sign a free trade agreement with Brussels by the end of the year but Tymoshenko’s seven-year prison sentence threatens to alienate the parties,” Liebich said. Tymoshenko was jailed over a controversial gas deal with Russia which she oversaw while prime minister in 2009. Many countries consider her incarceration to be a political move, with the EU threatening to stop negotiations if she does not get a fair appeals process. “EU integration may not be on the agenda – precedence has been given to Croatia and Turkey – but it’s in Brussels’ interest to maintain good relations with Kiev,” Liebich said.